Honey bees are busy little creatures, and as they forage for the natural materials they need to make honey, they also consume the nutrients they need. These insects are highly efficient at what they do, and even feed themselves according to the social hierarchy by which they live. Thanks to this efficiency, they are able to produce enough food not only for themselves, but for humans as well. The honey bee diet consists of two staples, both of which are produced by flowers: nectar and pollen. Nectar is the sweet water produced by and collected on plants like flowers, while pollen is a protein-rich powder. While bees drink up as much nectar as possible, they aren't gorging themselves -- they take it back to the hive, where it's used in the production of honey. 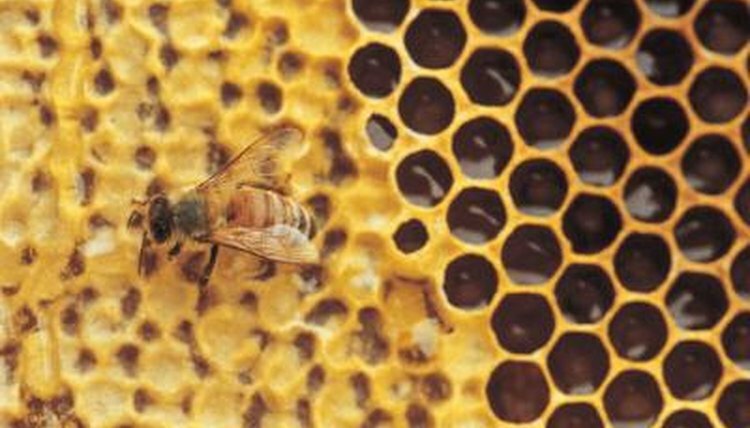 Together, nectar and pollen give honey bees the ingredients to produce the various types of honey needed for the colony's survival. Because larvae cannot leave and forage for food on their own, they are fed different recipes of food, starting with royal jelly. Royal jelly is a mixture of honey, pollen and nectar that is particularly high in protein and carbohydrates, which the larvae need in order to grow. After three days of feasting on royal jelly, only the queen larvae are permitted to continue eating it. The drone and worker larvae are then given bee bread, which is made from honey and pollen. Honey bees work feverishly throughout the spring and summer months to produce the honey that will keep them alive through the rest of the year. Without flowers to produce the pollen and nectar they need when the temperature drops, honey bees are completely dependent on their stores to survive the winter months. If they fail to produce and store enough honey -- the colony needs a minimum of 100 pounds to last the winter -- they may be forced to cannibalize within the colony, eating their own larvae and eggs. When humans keep honey bees for domestic honey production, they only take what the bees can afford to give up -- after all, the bees rely on the honey to survive. This is a testament to the honey bee's ability to produce an enormous quantity of honey, even after making enough to keep the colony well-stocked for the future. In a good year, a single colony of bees -- between 45,000 and 75,000 individuals -- can generate more than 100 pounds of extra honey, giving themselves and humans more than enough honey to feed on.